Dominican College, an NCAA division II school in New York, recently came into the New England prep ranks to grab two of the best guards left on the board. First it was St. Thomas More guard Tyjon Gilmore who committed to the Chargers earlier this month. The class of 2017 is now all but in the books with only a handful of players remaining undecided about their future plans. With that in mind, here's a look at some of the most recent prospects to determine where they'll head next. Gould Academy guard George Papas will return to his home state of New Jersey to attend Monmouth University. Papas was initially slated to head to George Mason as a recruited walk-on but will now be joining the defending MAAC regular season champions where he'll provide three-point shooting and a heady ball-mover and passer around the perimeter. 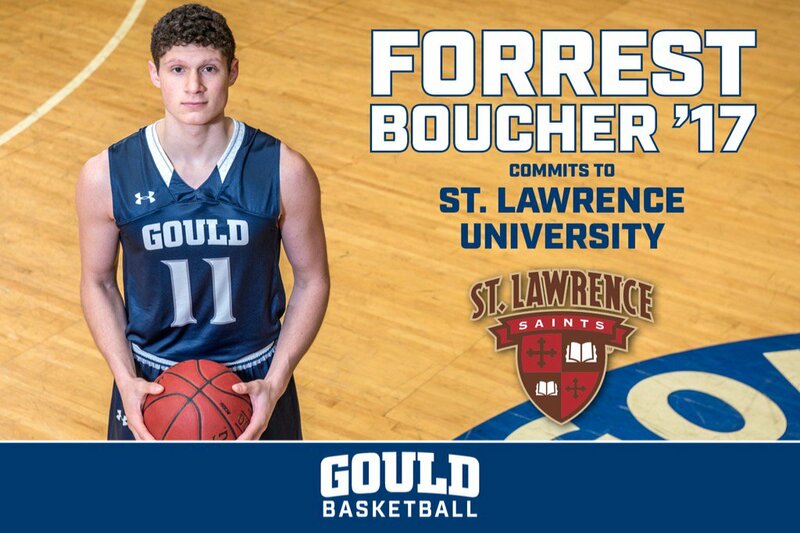 Papas' teammate at Gould Academy, Forrest Boucher, also recently solidified his recruitment as he'll head to St. Lawrence College next year. Commonwealth Academy guard Malik Pouncy made a commitment to Nyack College on Wednesday. Nyack is an NCAA division II school located in New York that competes in the Central Atlantic Conference. Pouncey is a 6-foot-3 wing who has long been known for his three-point shooting and ability to make tough shots without much seperation thanks to his especially high release. The Wolverines are also sending Charlie Considine to WPI. A big bodied forward who can stretch opposing defenses, he'll join Joseph Case wing Drew Plante, a big wing with a high basketball I.Q., who also recently pledged to head coach Chris Bartley. Redemption Christian post-graduate Courvoisier McCauley is also headed the D2 route after accepting a full scholarship offer from Lincoln Memorial in Tennessee. McCauley came to New England from his home state of Indiana and put up big numbers this year for Redemption. He's a scoring guard with a physical style who should be able to make an immediate impact at the division II level. The University of Saint Joseph had already added scholarship caliber players in Springfield Commonwealth's Cam Sells and Nadir Dixon-Thompson of the Master's School. This week though, they landed several more. Among the group of players now committed to play for Jim Calhoun is the Choate Rosemary Hall tandem of Brad Landry and Jake Sullivan, Hotchkiss School wing Ryan ONeil, Woodstock Academy point guard Chris Childs, and Master's School wing Tahj Brown. In short it's as good of a division III recruiting class as we've seen in recent memory.